Cape Town - The Springboks may need to dig very deep one last time before their summer break as they square up in Cardiff on Saturday to a Wales team smarting from their choking tendency in the closing minutes of Tests. The Welsh will be under special pressure to go the full 80 minutes here, simultaneously meaning that if the Boks have one foot on the proverbial plane home during the second half, they could be in danger of leaking just a second loss ever to these foes, who should have won the last meeting in Nelspruit in June. Long-serving Welsh loosehead strongman Jenkins (114 Tests) reportedly grapples quite consistently with hamstring issues these days, and might not have started this one but for the club-enforced absence of Paul James. 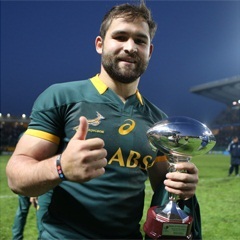 But he is still one formidable scrummaging factor on a good day, and thus a further acid test for Bok utility front-ranker Oosthuizen who must make the most of another opportunity to convince that he is the right back-up to currently crocked Jannie du Plessis on the tighthead side for SA. Getting a firm right shoulder needs to be the meaty Cheetahs man’s priority – he had a combination of some ropey set-pieces and other more satisfying ones against Italy - but expect the Boks to also get him careering onto the short-pass ball near the Welsh try-line whenever such chances may arise.